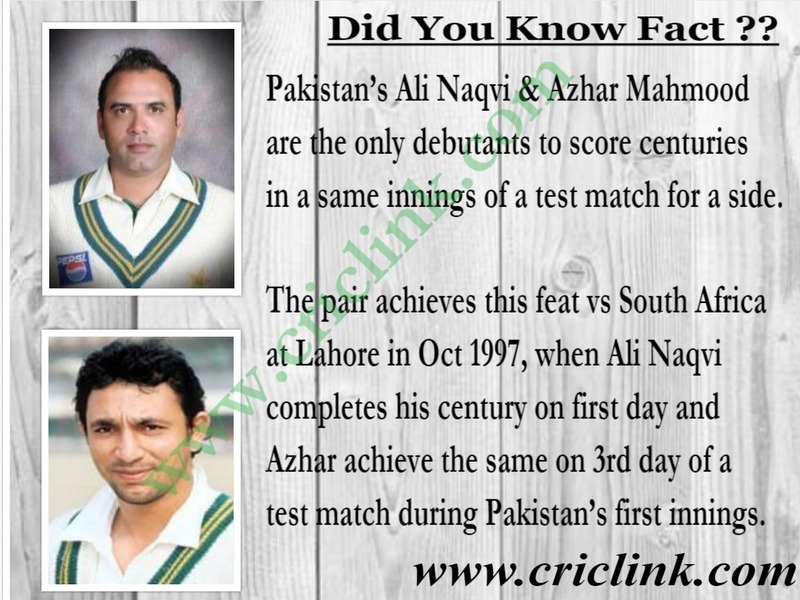 Pakistan’s Ali Naqvi & Azhar Mahmood are the only debutants to score centuries in a same innings of a test match for a side. The pair achieves this feat vs South Africa at Lahore in Oct 1997, when Ali Naqvi completes his century on first day and Azhar achieve the same on 3rd day of a test match during Pakistan’s first innings. Ali Naqvi represented Pakistan in 5 test matches but never cross the fifty run mark again in his career, whereas Azhar Mahmood went on to play 19 test matches for Pakistan and added to more centuries in his test record. Azhar currently serving as Assistant Coach of Pakistan national side had flourished more in ODI format where he played 143 matches for Pakistan and blossomed more after introduction of T20 cricket when he become a global icon and played all round the world in different leagues like Indian Premier League, Natwest T2O blast, Caribbean Premier League & Bangladesh Premier League over the years before pursuing a career in coaching. Previous Article Did you know about Chris Gayle unique record in test Matches ? Next Article Why Mohammad Abbas can be a key for success in England?